All good wishes to the Caribbean Review of Books which has been relaunched online recently under editor Nicholas Laughlin. Savannah with Tents, three-colour linocut, image size 8 x 12 inches. 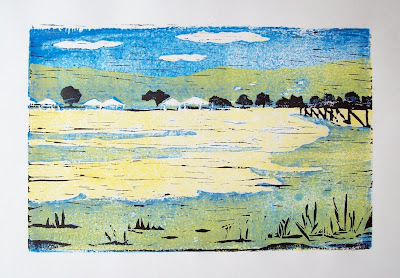 I cut three lino blocks for this image, blue, yellow and black. By printing the yellow over the blue I was able to get a fourth colour, green (and strictly speaking it's five colours if you count the white). The inking and printing are not of the best because I used water-based inks and printed it by hand. The water-based inks enabled me to do the print run over two days (not counting the cutting of the blocks). Oil-based ink would be smoother but it takes longer to dry and the clean-up is messy so I opted for water-based. Also, I printed it manually with a baren plus hand pressure which don't achieve anything like the pressure of a press. Under the circumstances I'm happy with it, especially that my simple little home-made registration method worked quite well. The main problem was the inking. I mixed the ink colours and they came out slightly different each time the block was re-inked. The consistency of the ink changes from minute to minute as well, but I'm getting a feel for what is about right. I'm pleased with this outcome, I have eight or nine presentable prints from two runs, and I have the blocks safely in a box where they will be one of the first to be printed if ever I get a small printing press which at present is not remotely likely. However, Google has helpfully been putting ads for printing presses in the margins of my emails, just in case. This is a very big put-down of painting. Time will tell if Harrison's claim is right or wrong, but in the meantime I'll go with wrong. First, whether something is an art or a craft is not a useful distinction. Second, there's some spectacular painting being done today, for example by Peter Doig, Chris Ofili, Gerhard Richter, Anselm Kiefer and Neo Rauch, and hosts of others, including the up-and-coming Trinidadian Che Lovelace. These are the names that spring to mind when I think of contemporary art, rather than installation or video artists (but of course this could be because I'm a painter myself). Third, as far as Harrison's claim goes, he's brave to make it. There's some evidence that an urge to draw and paint (to make marks) is innate in human beings and if that is true then painting (like the novel) will always be with us. Harrison goes on to describe Newman's Eve in detail. Everything is significant -- the size of the canvas, the fact that the red paint goes a few centimetres over the edge onto the sides, the fact that minute bits of white ground show through at the join between lighter and darker reds. 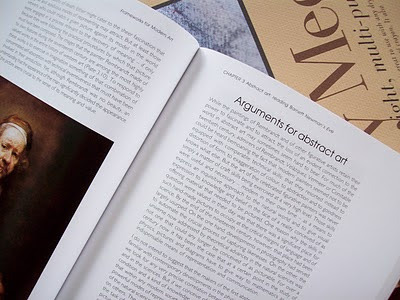 Some of the analysis relies on writings by Newman himself who was a prolific writer on art with exalted ideas. I tried hard to understand and to be sympathetic but in the end I was not convinced. Abstract art is fine but I don't think Newman's Eve is representative of abstract art in general. Maybe some of his other paintings are, I don't know. I was reminded of a saying of Josef Albers: "In musical compositions, so long as we hear merely single tones, we do not hear music."(2). For me, something like that applies to visual art as well. 1. Charles Harrison, in Frameworks for Modern Art, ed. Jason Gaiger, Yale University Press, New Haven and London, in association with the Open University, 2003, page 115. I'm reading a book called Frameworks for Modern Art, edited by Jason Gaiger, published by Yale University Press and the Open University. It's an academic text and it's not easy reading, but I hope to learn from it. I'm about to start Chapter 3 which is called "Abstract art: reading Barnett Newman's Eve." I've never studied Barnett Newman's work before so this could be a good introduction. Eve is a huge flat red painting with a narrow strip of darker red down one side. I confess I'm on the sceptical side, not about abstract art in general, which needs no defense, but rather about Newman's paintings, which seem to me rather featureless. Will reading the chapter change my mind? I should have some idea in about a week, watch this space.